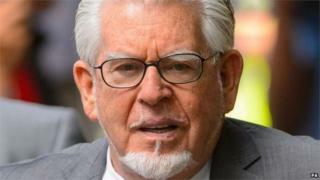 Rolf Harris should be denied parole after he reportedly called his victims "slimy little woodworm" in a song he has penned in jail, their lawyer says. Victims' lawyer Liz Dux said the lyrics - contained in a letter obtained by the Mail on Sunday - showed he had "no comprehension" of his crimes. The "revolting" song had left one victim "totally distraught", she said. He was sentenced to five years and nine months for the crimes, which took place between 1968 and 1986, and is understood to be serving his sentence at Stafford prison. In the letter to a friend, who revealed its contents to the newspaper, he said he planned to record the song once he is released, which he writes "will be towards the end of 2017". Ms Dux said if the letter proved real, his victims would be "furious and revolted" by Harris's "absolute arrogance". It showed he was "not in any way suffering any punishment for the great sins he committed", something the parole board should take into account, she said. "I think he's got no comprehension of how far he's fallen and the devastating effect he's had. "It should certainly affect the way he's treated when he applies for early release - he hasn't understood severity of his crimes." The letter, which the Mail says it got from someone close to Harris who was "appalled" by it, calls his victims "foul accusers" who wanted his money. The BBC has not independently seen or verified the authenticity of the letter. "the climate's great in Britain now for making loads of dough"
"slimy little woodworm, make him burn. Get your 50-year-old hooks into his dough"
"come and join the feeding frenzy girls"
"that old bandwagon you crawled out of (rotten to the core) conceals a host of foul accusers"
"perhaps you believe you're pretty still, some perfumed sultry wench"
In his letter, Harris said his "inner rage" came to the fore after eight months in prison. "I've started writing a song about the injustice of it all," he wrote, adding that it should have a "country rock sound". "I plan to record this the moment I get out towards the end of 2017." He added: "Prison is no hardship really. "I'm in the art room as an assistant to the tutor and basically I'm doing what I like." In court last July, Mr Justice Sweeney said Harris "clearly got a thrill" from committing some of his crimes while "others were present or nearby". As well as the girl who was aged seven or eight, Harris's victims were two young teenagers and a childhood friend of his daughter Bindi. He abused his daughter's friend between the ages of 13 and 19. Passing sentence, the judge said Harris had "no-one to blame" but himself.